All PDF patterns are also available in the Ravelry store. For many years I have dreamed of designing Norwegian patterns to share. I have been knitting since I was 5 years old and began teaching Norwegian knitting to my friends when I was 10. 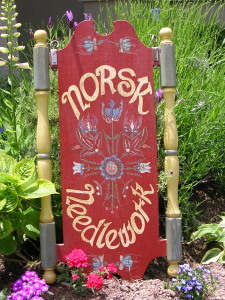 I had a brick and mortar shop called Norsk Needlework in Wyoming many ages ago. The sign for this shop was painted in Norwegian rosemaling by my father. You can see in the picture that the snow and rain took its toll. During the 10 years of the shop, I knit hundreds of ski sweaters and taught so many people to knit, loving every minute of it. For many years after this I was a cardiac/critical care nurse… but kept on knitting. Now I am retired and finally have time to focus on design. 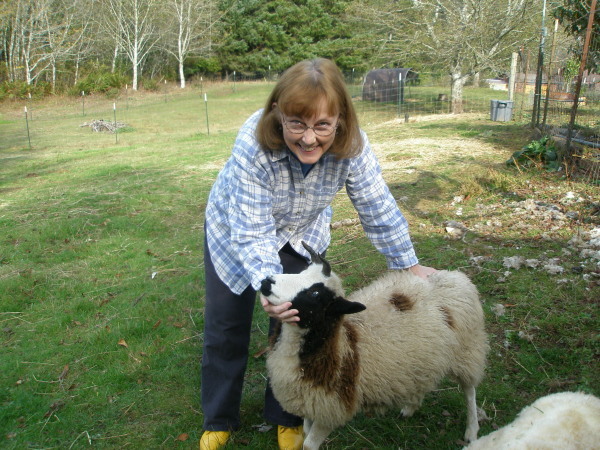 I am delighted to have retired and spent a few years onthe Oregon coast, where many of my friends have sheep, spin and knit. Now I'm living in a tiny house in Washoe Valley, Nevada. I apologize, I failed to complete the trip on my blog. I still intend to do it! This looks like a nice swimming pool, not so.. it is the pond for irrigation but the dogs and deer both love it. I am told the deer hang out in the woods in June to have their babies and are fully capable of fending off the dogs!!! baby in the center. This is right off our back deck. My Mac (Border Collie) and Annie (Australian Shepherd) who LOVE to swim in the pond, at least 2x a day. They stay nice and clean! I will be including more about knitting in Selbu and weaving. The looms and weaving really impressed me. All content on this website is copyrighted by Cynthia Peterson(C) 2011-2019 and may not be used without explicit permission.